Here's a new photo from Doug Liman's badass looking sci-fi film project Edge of Tomorrow, which is based on the book All You Need is Kill. 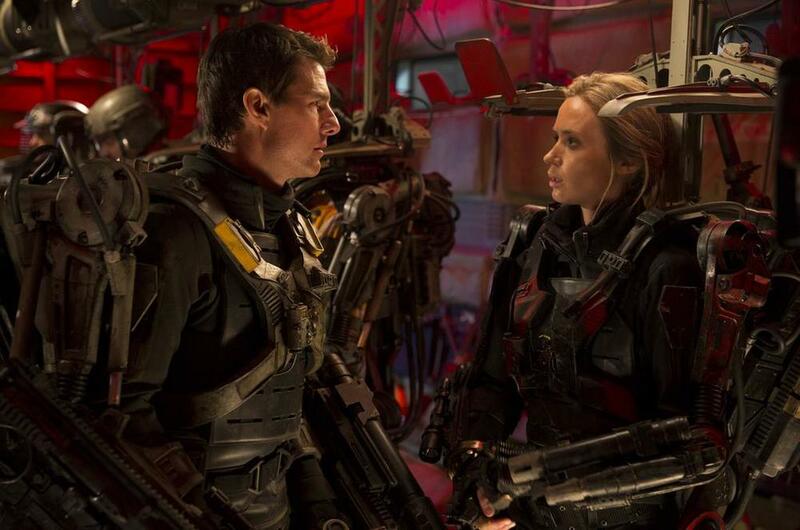 The imagine features Tom Cruise (Oblivion) and Emily Blunt (Looper) in a jump ship before they are dropped into battle. The story unfolds in a near future in which a hive-like alien race, called Mimics, have hit the Earth in an unrelenting assault, shredding great cities to rubble and leaving millions of human casualties in their wake. No army in the world can match the speed, brutality or seeming prescience of the weaponized Mimic fighters or their telepathic commanders. But now the world’s armies have joined forces for a last stand offensive against the alien horde, with no second chances. Lt. Col. Bill Cage (Cruise) is an officer who has never seen a day of combat when he is unceremoniously demoted and then dropped—untrained and ill-equipped—into what amounts to little more than a suicide mission. Cage is killed within minutes, managing to take an Alpha down with him. But, impossibly, he awakens back at the beginning of the same hellish day, and is forced to fight and die again…and again. Direct physical contact with the alien has thrown him into a time loop—dooming him to live out the same brutal combat over and over. But with each pass, Cage becomes tougher, smarter, and able to engage the Mimics with increasing skill, alongside Special Forces warrior Rita Vrataski (Blunt), who has lain waste to more Mimics than anyone on Earth. As Cage and Rita take the fight to the aliens, each repeated battle becomes an opportunity to find the key to annihilating the alien invaders and saving the Earth. The movie is set to be released on June 6th, 2014, and I can't help but think this is going to be an awesome movie!